"No matter how low your expectations of the users are, they will always find new ways to disappoint you." There's Unwinnable by Design, where a game is intentionally unwinnable if you do a certain thing. And there's Unwinnable by Mistake, where a glitch prevents you from winning. This situation is for when you can render your game Unwinnable by doing something utterly dumb, or something no sane player would attempt in any conceivable gameplay. This trope overlaps both with Unwinnable by Mistake and Unwinnable by Design. Usually it is the testers' job to think of the craziest possible decisions a player might make, and make sure the game still works properly. On the other hand, designers may decide they simply cannot prevent unwinnable situations from occurring altogether, and leave them in the game, reasoning that the player deserves such an outcome if they do something so obviously suicidal. Other times, it's a reasonable oversight. When the fruits of a few dozen programmers gets into the hands of thousands or even millions of players, odds are at least a few of them are going to be far more creatively insane than anyone could realistically account for. But compare Developers' Foresight for examples of where they actually do. In many genres, it's nearly impossible to avoid it. For example, in a First-Person Shooter, the player can fire away all the ammunition, enter a fight with a health bar at nearly zero, and save. In a strategy game, one can stay still, not gathering or building anything, and when the enemy attacks with overwhelming force, save. And in almost any game that allows you to save at any time, you can save just before (and sometimes just after) a death, when it's too late to do anything about it. The latter case can occasionally overlap with Unwinnable by Mistake in a game with quicksaves, if you hit quicksave when you meant to hit quickload and have no other saves; autosaves can lead to a similar situation, although you usually need to be playing the game in a slightly-insane manner for it to happen. Subtrope of Who Would Be Stupid Enough? - the answer is any player who attempts this. Compare Earn Your Bad Ending. Diablo has strong roguelike influences and can screw you over in numerous other ways. When you die, the save function is disabled, but not immediately. Yes, saving at this point makes the current game unwinnable. It requires timing by the milliseconds, though. A frame too late and the game disables the save function. The easiest way is probably to get a +HP item and then get yourself down to health lower than said item provides you. When you remove the item, you die. If you click and press ESC almost exactly at the same moment, you get to save without having that item on you. No, there is no time to put it back on. It's possible to make the game unwinnable by abusing the Chamber of Bone entrance in a hilariously stupid way. You need to teleport there before you use the book to open it (either with a scroll of teleport or using a scroll of town portal then going there from town) and leave yourself stuck in a sealed room. Yes, you need to be completely stupid to do this unless you're doing it intentionally for the lulz. Play through Dragon Age: Origins without ever taking a level or making a hard save. Get into a fight with an autosave at the start that you can't win at your low level. It's also possible to make the two candidates of the Orzamar throne distrust you, forcing a hard restart. In Banished, you can make it impossible to expand your town by wasting all your stone and iron (for instance by making tools and paved roads) and/or abandoning them on the other side of a river and dismantling the bridge that leads there, leaving you without enough stone to rebuild it. Since your only source of those two resources besides gathering are the Mine and Quarry (and they require stone and iron respectively) is the Marketplace (which also requires Iron to build) you're essentially left stranded. It's possible to make Monster Rancher 2 unwinnable. You get a Game Over if, at the start of the month, you have less than 10 G and are unable to feed your monster. In normal gameplay the only way to get this situation is if you saved after the last tournament of the month your monster could possibly enter, you have no items to sell, your monster is too young to sell, all of your monsters in storage are too young to sell, and your monster never brings you any item you could possibly sell for money out of the blue. Another, easier way is to combine monsters at the very start of the game until you run out of money, gaming over before you make it to the ranch at all. Myth The Fallen Lords: in mission 22 "River of Blood" your army starts before a massive wall and your objectives are to enter the perimeter and secure a bridge inside the area. The only gate is blocked by a wooden palisade, but you can blow it up with your dwarves. Unless for some reason you decide to kill them, forcing you to restart since there aren't other units capable of throwing explosives thus becoming stuck outside the wall. In Ragnarok Online, certain maps have mesas or other landforms or rooms that can only be accessed by teleporting to a random cell on the map. A player who doesn't have the teleport skill can use a flywing item to teleport until they arrive at one of these places, and if they run out of teleporting items on that exact teleport and don't know the skill, they are stuck because these places usually don't spawn monsters and if you are at a high level it's unlikely a monster would be able to kill you anyways even if you took off all your armor and buffs and stood there letting it try to hit you for an hour. There are ways to fix this involving the help of another person (like contacting a GM to help you, or another player to teleport until they get there too and hand over some flywings or Butterfly Wings, get close enough to trade, kill you themselves, or warp you), but on your own, there is no way to get out of the situation, to the point that Jerkass players with the Warp Portal skill would make save points at these places and place warps under random people's feet, teleporting them there without warning and, if they happen to not have teleporting items handy, without any convenient way to leave. Metroid: Fusion has the TRO Trap, which is a very tricky Sequence Break that lets Samus fight Nettori before defeating Yakuza. It fails because the game breaks when bosses are defeated out of the scripted order. In Metroid Prime 2: Echoes, it's possible with some heavy-duty glitch exploitation to skip the scene where Samus loses her gear to the Ing. The game can continue somewhat normally from there... but under no circumstances should you return to the area where that scene takes place. If you do, then the scene will play again, and all of your items will be lost. If you already collected them, then you can't collect them again. It's possible to find a 2-block deep hole in the (indestructible) Bedrock, and jump in with nothing in your inventory. Be sure that the area around you is also lit up or sealed off so that it will be impossible for any mobs to enter into the hole and kill you/aid in your escape. Rage Quit. After Beta 1.8 added a hunger meter, it became possible to starve to death in hard mode, though in peaceful mode you can't lose hunger, and in easy and normal mode you can't die of starvation. You can also make a pool of lava in your respawn point. This is a common griefing strategy, since it also ruins the game for anyone else who dies or tries to enter the server without having already created a bed-spawnpoint somewhere else. You can get a command block (this has to be obtained with a console command itself, even on creative) and set it up to the command /kill @a. This will kill everyone on the multiplayer server and yourself (even on singleplayer) if you activate the command block with a redstone impulse. The unwinnable part comes in when you set that command block to repeat mode AND always active (goes off 20 times a second), constantly killing everyone with no way to recover except editing the map in an external program and removing the command block. It is possible to make the first two Monkey Island games unwinnable if you try very hard. In The Secret of Monkey Island, spend all your coins, one by one, in the soda machine, until you don't have enough to pay for the sword, the shovel and the map. You can also use them up by giving them to Otis in prison. In the Special Edition this is impossible, since Guybrush will refuse to put more than one coin in the machine. In Monkey Island 2: LeChuck's Revenge, you need 6000 pieces of eight to buy a map piece from an antiques dealer. The intended path involves recovering the masthead from a shipwreck, which requires devising a way to strengthen your spit to win a spitting contest to raise money to hire a ship. However, you can get 1 piece of eight at a time for polishing one of the Men of Low Moral Fiber's peg leg; this cuts off before you get to 6000, but if you've bought something else from the antiques dealer, you can sell it back to him to get enough. Later, when Guybrush is captured by LeChuck, he needs to strengthen his spit to escape; if you skipped that path and didn't know about the drinks, you're stuck. The CD-ROM and remakes of the game cap the amount of times you can polish his leg at 19 pieces of eight, however. Maniac Mansion: You could certainly make an unwinnable state, though some were harder then others. The fastest route was to recruit Jeff (no special skills) and one kid with special skills, then getting the kid with the skill killed. The ways to kill off your kid, though, were often in this category. You wouldn't want to take a dip in a radioactive pool or microwave the radioactive pool water, or give Ed the remains of his hamster after killing it in the microwave. In Super Smash Bros. Melee and Brawl, if you do an endless-time match with pause turned "off" (i.e. activate the setting that disallows pausing during a match), you can't escape the match unless you turn the game off. This isn't as serious as other Unwinnable cases, and in fact could occasionally be by Unwinnable by Mistake (e.g. your friend keeps pausing the game to take Snapshots, so you end your match and turn pause "off." Then, forgetting that Pause is off, you later start an endless match to rack up your Playing Time. Unable to pause and reset your match, you made it unwinnable). But most of the time, you have to be trying. In Laura Bow 2, it is possible (although unlikely if you're one of those Sierra players who live under the mantra "take everything that isn't nailed to the ground, and even if it is, solve the puzzle to trigger the anti-nailing event to nab it") to make it impossible to get the good or semi-good endings if you've failed to get most or all of the evidence in the game. If you don't pick up at least the evidence littered by the dead bodies, it doesn't matter if you can successfully identify the murderer to the correct victim and motive, or that you've successfully identified who had what dirty little secret—without proof they can't do anything with the murderer, the Dagger will go missing again, and the killer will still kill Laura. Although a bit difficult (and unlikely, considering the game's emphasis in examining everything), you can find both halves of the Rosetta Stones in the museum, but not actually examine them, preventing you from writing down hieroglyph letters written on the stones to add into your journal. The problem comes when you eventually meet The Ra cultists in your chase, and you have to spell out the answers to their riddles using hieroglyphs (which Laura can't do if you didn't write them down, even if you know the answers). In Lux Pain, the game can become Unwinnable during Chapter 7. If you take too long finding Yayoi Kamishiro when she is obviously suicidal, then you will be told that Liu Yee is going after her and get an automatic game over. Your time is basically measured by Nami's phone conversations with you. If you save your game after she's talked with you three times, then the game is Unwinnable. Luckily, the game warns you and tells you to make a new save before all this occurs; you should be fine as long as you follow the game's advice. NetHack has uncountable ways to kill you, but very few ways to become unwinnable , most of which are variations of "tick off your quest leader before you get the Bell of Opening". It's not a bug — if you look in the game's source, you can see the developers included code to handle just that vanishingly unlikely situation. Since shoplifting is serious business, shops are a good place to trap yourself. If you use or break some of the store's wares, the shopkeeper will block the exit until you pay them back. If you have insufficient gold and sellable items, can't sneak out (requires digging or teleportation), and aren't strong enough to kill the shopkeeper, you're stuck. A "liquor emporium" works well for this, since everything for sale is fragile glass bottles, and the shopkeeper only accepts gold and potions as (re)payment. Trying on a cursed cloak of invisibility with no means of uncursing it is a more plausible way to get trapped in a shop (you can't unequip cursed items, and shopkeepers will block the door when you're invisible, even if you're already inside). The airship Highwind is required to continue parts of the story in late Disc 2 and Disc 3 of Final Fantasy VII. Thanks to the ability to bring Chocobos on board, it's possible to permanently lose access to the airship by bringing a special Chocobo on board, parking it in an isolated area, riding your on-board Chocobo over mountains, rivers, and oceans back to the ranch, and releasing it (along with any other Chocobos you may have). In doing so, you have just lost on-foot access to the Highwind - which, as stated, is necessary to advance through the game. You no longer have any special Chocobos which might be able to bring you to the Highwind. Furthermore, it's impossible to breed any new special Chocobos because doing so requires "good" and "great" Chocobos, which are not found on the first continent. Your only way to access the second continent at this point is the Highwind...note The Cargo Ship which allowed you transport between Junon and Costa Del Sol stops running after you get the Highwind which you just lost all access to. For extra kicks, park it somewhere just nearby, like at one of the islands near Fort Condor, so you'll be able to see it and know that it's forever out of your reach. If you already have Cloud back in your party after getting the Highwind, you'll need to access the sub and park it in Costa Del Sol first. Missions in Final Fantasy Tactics Advance cost money, so you can buy and sell items on the shop until you don't have enough money or sellable items to pay for your first mission. One can make an unwinnable save-state in The Last Remnant, but only by deliberately doing so. Going to an area with incredibly high level monsters (compared to the current party), making them aggressive towards Rush, having them chase Rush into a corner and then saving will make the game essentially unwinnable, since upon loading there will be no way to avoid the encounter, and subsequent defeat. Right before you fight the Disc-One Final Boss, you are trapped in a Plot Tunnel with no way to go train your characters. If you overwrite your only save file then and are too weak to beat the boss... This qualifies as Insanity because the game has way more save slots than any player would need, and the game adds an extra warning just for that section before overwriting your save files telling you that you can't go back if you are too weak, so the only reason to have a single save file and overwrite it then is because you want to trap yourself. In Duke Nukem 3D, you could actually save while dead. However, the game protected you from ill-timed quick saves, stating helpfully "You cannot "quick save" when dead!" This can be made much worse in Doom or source ports, where you can quicksave with a Cyberdemon Rocket right into your face and loading said save data proves that you cannot escape fate, except in rare times when disabling Screen Wipe gives you the fractions of a second required to sidestep the rocket. In SaGa 2, utilizing the "trashcan bug" can result in this if you overuse it. Using the trashcan at specific MAGI counts will give it the effect of other items. Most are pretty ordinary, but if you have exactly 67 or 68 MAGI, you can get free permanent-stat raising potions (Power at 67, Speed at 68) if you do this. However, overusing this glitch will screw up your MAGI counter after a certain number of uses (depending on equipped MAGI) and leave you unable to progress with the game. In TaskMaker, you have to find an object requested by the title character to advance in the game. Should you choose to Bestow the task item to an NPC and then kill them, it will very likely not be on their person when they die. However, there are often far better objects that you can Bestow, and you don't really have to Bestow in the first place (it's mostly used to calm down angry monsters, but only up to a certain level). It's entirely possible to do this in Resident Evil 4 and Resident Evil 5 if you sell all of your weapons and do something with the cash like purchase nothing but First-Aid Spray, ammo or grenades. It's also possible to kill merchants. Kill the merchant right before the Salazar fight ... goodbye Leon! A specific method occurs in Fire Emblem: Genealogy of the Holy War - if Quan and Ethlyn survive Travant's ambush in Chapter 5 and if you let them conquer Phinora Castle, which is your next step at that point... Congratulations, now Phinora is an allied castle and you can't conquer it back, meaning that you're stuck in Yied Desert with no way to advance further in the game (since your progress is very linear, conquering a castle disables the Invisible Wall guarding the next one). Though you have to try really, really, REALLY hard to pull the whole thing off. You can make Fire Emblem: The Blazing Blade unwinnable by managing to get everyone except Lyn killed in Chapter 3. Then in Chapter 4 you'll be tasked with protecting a NPC with Lyn guarding the way, but the tutorial will force you to move her away to talk with an enemy leaving the NPC completely defenseless. Defied in the tutorial of Fire Emblem: Path of Radiance; if you throw away Ike's sword just to see what happens, Mist will scold and re-arm you. Throughout the series, one can break everyone's weapons, then spend all your money on non-weapon items. Congratulations, you can no longer damage your enemies! Fire Emblem Awakening rectifies this by giving Chrom the Falchion to start with, which is unbreakable and unsellable, and if he dies it's Game Over anyway. Still possible, however, if you give the weapon to someone who isn't Chrom (which is stupid in itself unless you give it to the original Marth due to anyone else either being unable to use it or already having one), making it impossible to retrieve it anymore unless that person happens to be there. It's no longer possible as of Fire Emblem Fates, due to ditching the durability mechanic for all non-staff weapons. Robo Warrior. Using up all your life rings before you traverse a water area is a pretty stupid thing to do. In Tomb Raider III, it is possible to jump into the small water tunnel in the empty third water tank in Thames Wharf before you fill the tank. The jump is rather challenging and requires careful timing. Doing this will lead you to the edifice, but the edifice's exit will be too high for Lara to reach, thus preventing her from finishing the level. The empty tank has no ladder and is too deep to get out of. This can be corrected by reloading, but if you save after making the jump, Lara will be stuck in the edifice forever unless you restart the level. In most of the classic Tomb Raider games, health packs are in limited supply. Some levels will force you take unavoidable damage. If you use up all your health kits, it's entirely possible to be stuck in a dead game where you can't survive the damage thrown your way without healing. To counter this, most of the modern games in the franchise refills Lara's health to full if you reload your last checkpoint upon dying. King's Bounty has an area which can only be reached by flight, and which contains only a single treasure spot. If said treasure spot contains non-flying creatures, and you were to recruit them and then ditch your flying creatures, and you didn't have any Town Gate or Castle Gate spells, you would be stuck there forever. In Lands of Lore 2, it is entirely possible to drop an absolutely vital item into a river and you'll never see it again. The third game makes this impossible. In Phantasy Star III, using an Escapipe to exit a prison cell you are thrown into early in the game results in Script Breaking that renders the game completely unwinnable by trapping you in the starting town forever (one NPC even engages in Breaking the Fourth Wall to suggest you reset your Genesis and start over). The only way to afford the Escapipe at this point in the game is to sell all of your equipment. Early in Exit Fate, you can sell all your equipment and use all money you have now to buy consumables, then waste them, and you'll be permanently stuck in a town where you're required to rest at an inn, but don't have the money to do so. Many Role Playing Games try to avoid the "You need to rest at an inn to advance the plot but you don't have the money for it" problem by either making the stay at the inn free just for that time or having someone else pay for it. In "Toys N The Hood", the first real stage of Dynamite Headdy, you have 2 platforms out of reach. Your goal is to pull one of them close to you with your detachable head so you can hop onto it. If you purposely stand as far away as possible, pull the platform to you, and run away immediately after, when the platform comes to you, it'll be too far away for you to reach the ledge or the other platform. You can't kill yourself either. Here 's a video demonstrating this. Portal and its sequel have certain rooms where you can trap yourself, making it impossible to continue. (In the Xbox Live port of the first Portal, there is even an achievement for trapping yourself so that GLaDOS had to help you escape.) That said, Valve found most of the possible ways to trap yourself, and added dialogue on your state as well as providing a way out (by lowering a wall or dispensing an extra cube, for example.) That said, they didn't find every possible trap, so some weird cube or portal manipulations may leave you permanently trapped. Another example would be piling cameras under the weighted companion cube to support it while it's partway on the button, going through the door where the button to open the incinerator is, and then shoot a portal to make the camera fall through and the cube come off the button, so the door closes and you're trapped. The room showcased in that second video also shows up in The Stanley Parable when following a certain path in the game, namely the Video Games path. You can get the cube stuck outside like in that video. Like GLaDOS, The Narrator never helps you, but unlike GLaDOS, you do get some humorous dialogue instead. In Silent Hill: Downpour, you get the Forensic Flashlight in the Centennial Building. You can switch this out with a standard flashlight in the police station if you hadn't already grabbed it. Then, if you enter the orphanage, you are stuck with a large number of enemies that are invisible without the Forensic Flashlight's ultraviolet setting. Not technically unwinnable, but getting through is statistically impossible. The game has an Optional Party Member named Shadow, a wandering ninja you can hire temporarily. At one point in the game, if you try to take him back to your main base in Narshe, he leaves at the front gate, before you're properly inside. It's also possible to bring a one-person party with him when you hire him; this one person can be Gau, who — if you use him to fight in a special location called the Veldt — can leave temporarily. Therefore, if you use Gau to recruit Shadow, then lose Gau in the Veldt, then take Shadow to Narshe, you can end up with a zero-person party and be unable to do anything. The insanity comes from the fact that you have to traverse most of the game world on foot, then run away from most battles (so Shadow doesn't decide he's earned his fee and leave), with only two characters in your normally-four-headed party for the first leg of the adventure and only one for the later part, to pull this off. There is an obscure glitch that allows the player to end up with an airship at a stage of the game where this isn't supposed to be possible. Landing in the wrong spot can completely ruin the game's scripting. The glitch starts when you play almost half of the game without saving, then deliberately die, which certainly explains why playtesters never caught it. In the original Japanese release of the game, during the Opera event, if you skip one of the rats on the rafters and finish the event they'll still be in the Opera House in the World of Ruin, however the checkpoint if you die to them is specifically in the World of Balance map. At this point dying to them will take at least half an hour of being attacked and you can kill them in one hit, but if it happens you're back in the World of Balance with all the plot triggers already tripped, and can't get back to World of Ruin. This was fixed in every other version of the game. Final Fantasy X-2: Once you pass a certain point in the story, all of the enemies in the world will have been elevated to at least mid levels. If you avoid as much experience as possible throughout the game while also skipping all side events, it is possible to reach a state in which even basic enemies are undefeatable. In Tales of the Abyss, if you start the Mushroom Road sidequest before entering The Very Definitely Final Dungeon, Luke leaves the party to give place to Asch. You can then go all the way to the other end of Mushroom Road to get out to the world map (in a cliff where the Greater Flightstone is) and then use the world map glitch to get out of there without getting Luke back. This lets you play as Asch for as long as you want,note You can go back to Mushroom Road to get Luke back whenever you want, though and Asch replaces Luke in every scene (except for one needed to get Tear's Infinity +1 Sword, which will not trigger). If you finish the game while using Asch, you will start the next cycle without Luke. Once you get to the tutorial battle, the game freezes because you don't have any character in your party. If you saved your clear data over your only file, you are now stuck inside Duke Fabre's Manor forever. The world map glitch by itself can be this. To use this glitch, you need to take the disc off the PS2 while being on the world map, which will make the scenario disappear, and allows you to walk over the water, mountains, etc. You can then put the disc back and wait for a while for the scenario to come back. However, if you are over a unwalkable path (over the water, for example) when you do this, you get stuck and cannot even use the world map glitch to leave, as you will be unable to move. It is possible to save the game whenever you want while being in the world map. If you save in this condition, you are stuck forever. In Half-Life, in the "Questionable Ethics" chapter, you can deliberately trap yourself in the rotating door near the end, by triggering the turning process and moving back, then entering the side part of the rotating door. Half-Life 2: It is possible to avoid picking up the crowbar at the beginning of the game and abuse the physics system to proceed until the Route Kanal chapter where a wall of boards is unbreakable without the crowbar and the player is gated out of being able to go back and retrieve the tool. The Curse status ailment cuts your life bar in half every time you die from it, and before a patch it stacks up to 1/8 maximum health. If you were to get cursed repeatedly and not have any Purging Stones, you could easily get trapped. This could potentially qualify for Unwinnable by Mistake, but what Dark Souls player with any common sense would allow him/herself to be repeatedly Cursed? You can get stuck during your first run through the Painted World of Ariamas by aggroing the area bossnote She normally lets you leave without attacking, but will never forgive you if you hurt her. Try to leave while she's mad and you just die from the fall. and letting her kill you, then discard all of your weapons and armor. Normally, they'll sit where you left them waiting to be picked up again, but dying or quitting the game makes them disappear permanently. After that, you're left mostly defenseless with only a weak punch to fight with. Exactly one enemy in the area drops either a shield or a spear, both weak and available in the starting area of the game. Going in under-leveled and you won't have enough natural resistance, either. Since you can't warp out the first time you get there, you'll be easily killed in one hit by pretty much everything here, boss included. You can try Cherry Tapping the boss, but it will require both incredible luck AND skill. Your only other option is to power level your way out by killing the Mooks in the area, but even then you'll have some difficulty and you'll need to get to the Absurdly High Level Cap. Dark Souls II: The Duke's Dear Freja is a giant, two-headed spider whose body is completely invincible. You can only deal damage by hitting her heads. If you do a large amount of damage to one head, it gets cut off her body. Normally this amount is large enough that you can't cut off both heads without killing her first, but if one were insane enough to use the Warmth pyromancy and deliberately heal the boss so they could cut off the other head, they would make the fight unwinnable for themselves. Fairly early into Xenogears, there is a level where Fei goes by himself into a cave piloting his gear. There is a service robot he encounters, which the game gives you the option to fight and kill. This robot also sells you gear parts, which you'll probably need to survive the wave of boss battles ahead. If you save your game after killing the robot, then the upcoming battles are nearly impossible without a gameshark. And no, you can't just grind to obscene levels, that's not how Xenogears works. In Xenoblade, one quest on the Fallen Arm spawns the Bright Wisp, which drops a key item. Unlike every other enemy that drops a key item, the Bright Wisp respawns, so you can obtain multiple copies of the key item. However, the key item is not needed for the quest, and this enemy's appearance is not announced. The unwinnable part comes into play if you defeat the obscure Bright Wisp 100 times and loot 100 of these key items. The game will prompt you to discard an excess item (99 is the limit), but as it's a key item, it can't be discarded, and the game is stuck. In the Left 4 Dead series, survivor bots will attempt to go to you when you're incapacitated so you can be revived. Bots are also programmed to teleport near the player's location should the bot's path finding fail and get stuck. However, should the player go down in a place the bots cannot reach them, even if it's physically possible to get there, the bots will be confused and unable to reach the player, leaving them to bleed out. This can also happen if the player goes down in some place that you can physically reach out to help them up, but because the bot's path finding isn't programmed to go to that spot, you're boned. In Castlevania: Symphony of the Night, you can make Richter slide out of the castle before the gate closes... with no way back inside. In Vault, a woman gives you a bone every time you talk to her. You only need one (to give to a dog who shows you a secret dungeon), but it's possible to fill your inventory with undropable, unsellable, entirely useless bones. The devs added amusing cutscenes if you do something like navigate Morgall Forest without the Force Gem (getting you stuck in Altin) or give Piers the Lash Pebble before he leaves the party (getting you stuck outside Lunpa's house). The cutscenes fix the respective problems, leaving you free to continue. In X3: Terran Conflict, firing the Unfocused Jumpdrive takes you to a randomly generated Unknown Sector. Firing it again takes you back to wherever you jumped from. Each firing costs a predetermined amount of Energy Cells; just in case you've used your very last to fire the unfocused jumpdrive, every Unknown Sector you spawn into has a crate of energy cells free for the taking. If you destroy that crate, however - which is almost impossible to do unintentionally - you're stuck there forever. Fortunately, the game being a mod-friendly PC exclusive means there's no situation that can't be gotten out of by cheating. Being unable to have a conversation with an NPC when the NPC's dialogue is necessary to continue or complete the game, by: killing the NPC while having no way to revive them, erasing them or their remains from existence, or putting them in a state of permanent aggro when death and revival is not an option. In Ultima VI, Glen the Mortician can turn any corpse in inventory into an urn, including the bodies of plot-critical NPCs, leaving no possibility for resurrection. In Ultima VII Part II, the crematorium in Monitor can destroy anything, including quest items and bodies loaded with quest items. In Ultima VIII, quest items and plot-critical NPCs are lost when contacting water or lava. Items can be dropped in directly from inventory. NPCs can wander into a body of water. And both items and NPCs can be made to fall in or be knocked in through creative use of the physics engine, such as placing a series of steps and barriers near water, using throwing items like darts, or having too much fun with explosives. In Doom E3M9 (Warrens), it is possible to lock yourself out of the first room by pressing the button to lower the first door in the level and then quickly running through the door before it closes. This will prevent you from beating the level. In Luigi's Mansion: Dark Moon, it's very possible to lock yourself outside Treacherous Mansion by going to the Nautical Exhibit, putting an object on the switch when there are still ghosts in the area, then entering the door just as a ghost punches the object away. This leaves you stuck on a balcony with the only way out being to restart. Of course, you have to be really, really trying to pull this off, as shown here. In Recettear: An Item Shop's Tale, you could theoretically squander all your money (for example, by repeatedly buying a bunch of crap from the market then selling it back at a loss immediately) the day before a payment is due and then save your game without keeping a backup save in another slot. This doesn't actually render your save file useless though, since a Game Over simply gives you the bad ending, then sends you into a New Game+ minus all your money and any rewards you would've gotten for beating the game. In the SNES Shadowrun if you sell all your weapons before being sent to the caryards, an NPC hands you a gun that is weaker than any other gun in the game, can't be acquired any other way, and only exists to keep the player from getting stuck in the arena with no weapon. After getting back out, you can still sell all your weapons and armor, hire bodyguards and then run around accomplishing nothing until there's no money left. In Stick Ranger, it is possible to sell all your weapons and then blow all your money, making it impossible to fight bosses to progress in the game or gain any new weapons. Right at the start of Stage 22 in the Game Boy game The Bugs Bunny Crazy Castle 2, you're seemingly forced to get the hammer and pick axe. You can't get very far without the hammer, and you'd be stuck at one part of the level without the pick axe. However, it actually is possible to get past the beginning part of the level without getting the pick axe, by getting the hammer, then breaking the rock at just the right moment that the enemy behind the rock is going the other way, then sneaking past that enemy. It's much more difficult than simply going the other direction and collecting the pick axe while doing so, and would probably never even occur to most players that it's even possible to sneak past the enemy here, and really, there's no reason to even try except for the sole reason of getting past the start of the level in a way you're not meant to, which leads to getting stuck in one part of the level, since you won't have that pick axe to climb out of an upcoming pit, and if you kill the enemy in that pit, you'll be forced to reset the game! Ancient Domains of Mystery has two bonus dungeons that only open at certain levels; the Pyramid and the Minotaur Maze. If you reach a certain level without completing them, they close up for good, rendering everything inside unobtainable. It's possible to enter them, drop one of the Chaos Orbs, then leave. If you gain that level while the orb is inside, the orb is irretrievable, and you can't open the locks on D:48. This is nigh-impossible to do unintentionally. And in older versions of the game, if you became entangled in webs on D:49, you would be completely incapable of breaking free, and would be trapped, slowly starving to death, one floor away from victory. There is no reason ever to use webs on D:49, since no monsters ever spawn there. In Shin Megami Tensei IV, you can get stuck at Ouji and Minami Senju before you get the Global Airship if you spend the 500 Macca to go there when you have less than 700 Macca total (as it only costs 200 for the return trip) and don't have the Scout Bonus or Fundraise apps or enough App Points to purchase one. Note that you can still buy your way out...if you spend the real-world cash needed to get the DLC mission that can give you more App Points (unless you are in a region, or your 3DS's region is set as such, where the DLCs weren't greenlit for sale, like in South America. Which bounces back into this trope). 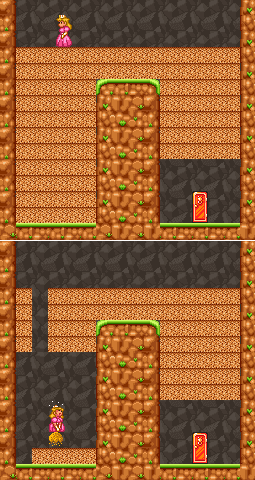 In Sensory Overload, enemies would sometimes come out of rooms that were locked to the player, but they could enter the room while the door was open, resulting in them being trapped when it closed. In Rune Factory, save while poisoned and sealed with no food or recovery/healing items deep in a cave. We dare you. Later games rectify this by allowing the player to use teleport when sealed and having them, depending on the game, wake up in the clinic or in their bed at 10am if they run out of HP (although you can kiss your life savings goodbye if the clinic revives you). Even in the Forest of Beginnings in Rune Factory 4, where you can't use teleport at all and running out of HP causes an instant game over, you can't save and get yourself stuck there. In the ZX Spectrum game Nonteraqueous, you are a robotic "Seeker" who is powered by "Psyche" which you have to keep topped up by using "Psychers". Unfortunately, some Psychers contain decayed Psyche which will kill you instantly. Another way to refuel is that some rooms boost your Psyche when you enter, so you can repeatedly leave and re-enter such a room... but if you attempt to boost your charge beyond the maximum, you are told that you have overloaded and killed yourself that way. Strife, being an early First-Person Shooter game with RPG Elements and actual NPCs, had a few instances of this. The plot, while allowing for Multiple Endings, was rather easy to break. One notable example, in a lot of But Thou Must! conversations, you can Take a Third Option by outright refusing to advance the plot, which has the added bonus of provoking the local acolytes/rebels/etc into swarming you. There's also a certain sidequest that's less Unwinnable by Design and more this trope if you pick up on the hints that the person giving you that quest can't be trusted. Zoo Tycoon: If you spend too much of your money and don't have enough animals and/or things to sell to get some back, you can be put in a situation were you cannot buy more animals and things, and if you don't have enough animals because they all died or something, you cannot even slowly make more money because you won't get enough guests. The only solution other than restarting or loading a save file is to use a cheat code to make more money. This sort of situation, where you have no money and no way to make money, was what caused the original SimCity to add a lose condition. If you mess up too bad, you get a game over. Newly created characters begin the game with the Backpack, a 16 slot bag. You can acquire up to four additional bags and change those bags as you progress, but everyone is stuck with the Backpack, which cannot be removed or upgraded — which gets annoying when endgame players have access to 30 slot bags and would really like that extra space. The dev team is aware of this, but have said in the past that one of the reasons keeping them from addressing it is that they're sure some damn fool would find a way to unequip all their bags at once and render themselves permanently incapable of ever picking anything up. In Legion a druid player revealed they were incapable of doing the quest required to gain the artifact weapon central to the new expansion. Why? They had managed to make themselves hated with the Cenarion Circle, the faction all druids belong to, and so could not speak with any of the NPCs. They'd PvPed extensively in that zone and killed guards, destroying their reputation. Not entirely unwinnable as they could regrind the rep in a raid, but still impressive. Starcraft has one in the very first non-tutorial mission, "Wasteland". The mission objectives are 1) find Raynor and don't let him die 2) build a barracks 3) train 10 Marines. And yet, there's no failure trigger for being unable to train more Marines because there are no more minerals on the map. What pushes this up to Insanity is how wasteful you have to be with your minerals to reach this point: aside from the cluster of minerals near your base, there's another hidden mineral cluster that brings the total available to somewhere north of 5000 minerals. the barracks and 10 marines cost 650 minerals total, and you start with 5 marines that also count towards your total. But nothing's stopping you from blowing it all on way more Supply Depots than necessary. And such a failure trigger doesn't seem possible, given the limitations of the Trigger system shown in the Starcraft editor. In Quest for Glory I, there's a tricky-but-possible way to die that involves resting in such places as the graveyard, which change between day and night, and staying until nightfall. When night falls, try to leave, and die of a "program bug". Early on, there's a Saurus dealer right outside of Shapeir's main gate, who aggressively tries to sell the player a Saurus. If you repeatedly leave and re-enter the screen, he'll get increasingly insistent that you buy a Saurus, eventually Leaning On and later Breaking the Fourth Wall. Push him enough and he'll get frustrated and leave, saying he was just trying to help you win the game, and the Have a Nice Death screen reinforces it by saying that the Saurus you should have bought went to someone else and you can't progress any further in the game without it. Late in the game, after you reach Raseir, you need to become friends with Signor Ferrari in order to have a place to stay (if not, you will be arrested for vagrancy causing a Game Over). One segment requires you to pay five dinars to Ugarte for information (which you can haggle down to three if you "bargain" with him). If you do not have the three dinars before you first meet him, Ferrari will kick you out and you lose the game. What makes this insanity is that you received 100 dinars from Omar on the evening before your departure to Raseir, and you had less than three in-game hours to spend it all before nightfall. In Quest for Glory IV, it's possible to attack Tanya or Toby; you don't immediately lose the game if you do so, since Toby just kicks you out of Tanya's room; but at that point you still have unfinished business in Tanya's room, which you can't finish because Tanya will kill you if you go back in. Very early in RuneScape before a method of banning rule breaking players had been programmed, there was an inescapable area called the black hole that rule breakers were trapped in. When players started breaking the rules to get sent to the black hole deliberately just to see what it was like, a method of entering and leaving the black hole was added. Some players then trapped themselves in the black hole by dropping the item that allowed them to leave (possibly due to being tricked into doing this by other players). The MMORPG Trickster Online allows you to sell or accidentally drop (destroy) quest items necessary for the story quests. They cannot be replaced, petitioning a GM will only get the response 'well you shouldn't have done that'. Although the game is still playable about 1/2 of the single player content is forever lost and all the EXP those quests can give is gone. In A Little Lily Princess you have a choice of activities every week. Since you need enough points to unlock activities, you can also choose to skip the week, doing no activity, in order to build up more points for the next week. If you keep refusing to do any activities at all, eventually the story mode runs out of story, leaving you with just the event-activity-choice screen, over and over again. If you still refuse to play an activity and keep clicking "Skip Week" until a hundred weeks have passed, all the activities expire and you are locked into a loop where you can't do anything but click Skip Week. Forever. In The Legend of Kyrandia, Brynn asks to see your grandfather's letter when you meet her in the Temple of Kyrandia. If you burn the letter in the temple brazier instead of giving it to her, you'll be unable to progress. In Bubble Bobble Plus, the WiiWare remake of Bubble Bobble, while playing Classic mode, if you get an EXTEND on Round 99, something incredibly specific and up to luck, one can skip the final level (Round 100), and go to Rounds 101-104. Rounds 101-103 are the three secret bonus rooms, and Round 104 is the EXTEND cutscene's room. Dying once in Rounds 101-103 skips to the next round, but death in Round 104 has no effect. There's no way to attack the Super Drunk, thusly trapping the player forever. Furthermore, if you use a continue after all players die, the Super Drunk doesn't even respawn. In Chaos on the ZX Spectrum, a wizard's summoned creatures can't use close-quarters attacks on friendly units. But the developer forgot to do the same for ranged attacks. This means a situation can arise where a wizard kills their last opponent (which would normally end the game with a victory) but then turns their ranged units on their own wizard and knocks themself out of the game, too. With no players now left, the game plays out its remaining turns as a series of empty screens, and finally declares a draw. Arcanum: Of Steamworks & Magick Obscura really tries to avert unwinnability, and if nothing else, you can consult a guide and wander the map until you find the next location on your quest. However, at one point, you need to get to the Isle of Despair, which requires the aid of Captain Edward Teach. Kill the Captain, and you're permanently locked out of the Isle and the game cannot progress. During the Prologue, Gorion casts a number of Level 3 spells but autokills any enemy he targets with the spell once it is cast. Stay out of his line of sight and use spells like Cloudkill or Stinking Cloud to pacify him from a distance, then awaken him with offensive spells, arrows or melee. The best option possible is to bounce a lightning bolt off the stairs so it hits him multiple times. Killed Gorion, Candlekeep can't be left. The spells mentioned can only be learned after you leave Candlekeep, so you have to go out of your way to import an old character for this to happen. It is possible for your main character to be killed the right moment where you cross a transition into another area. This might lead to an autosave. If for some reasons you didn't do any other previous save and this one overwrites your only autosave, you're basically condemned to reload a perpetual dead character until you restart. Some plot relevant items can be dropped in area with limited access, that will become unavailable after leaving them. In Might and Magic IV, people running around with no space in their inventory can lose the one unique weapon required to harm the Final Boss. It is actually possible to get another copy of the weapon with a cheat code  then again, you might be playing a translated version where the code was changed into something undocumented. In the original Metal Gear, during the passage of the game where you rescue Gray Fox, if you run straight through his cell without untying him and run past Shoot Gunner/Shotmaker to retrieve your M92F, you can then go back to Fox's cell and murder him. You don't get a game over, but you take a massive hit to your Rank from which it is impossible to make up the difference, meaning it is not possible to get in touch with Jennifer at the point in the game when you require it. There's a glitch in Metal Gear Solid where, if you inexplicably decide to backtrack all the way to the bottom of the comms towers after a certain point in the late game, the lift back to the top of the comm tower will never appear. It is possible in older versions of Bloodborne to trigger Rom, defeat her, then trigger Amelia and defeat her then touch the skull, effectively reverting the Moon Phase back to Night right after a player had it at the Blood Moon phase, which walls off parts of the game and ruins a play-through. In order to do this, a player had to deliberately sequence break the game using glitches only a speed-runner would actively be trying to use. It is possible to fight two cut bosses from the game by inserting specific glyphs which will never come up by accident as they aren't tied to any chalice. The bosses are hard due to glitches, but if the player isn't aware that the only way to return to the dream is by throwing themselves to their death off of a cliff, the player may exhaust every other option until they realize they can't escape this area which has no lantern. As such, without this knowledge, the player dooms themselves to a glitches area they can never leave, and the game autosaves the players progress upon entry. Persona 5: Once the player sends a calling card, they are automatically sent to the Palace the next day. This is because calling cards can only be used once to make a limited window of opportunity to steal the Palace's treasure; if the window expires, the treasure loses material form and the Palace ruler's cognition can't be changed again. The game expects the player to take down the Palace ruler, thus they're told repeatedly that sending the calling card is a one time thing, and can't leave the Palace if they've already used it. However, there's nothing stopping the player from level grinding until they run out of SP after the calling card has been sent, preventing them from being able to beat the boss, and preventing them from leaving the Palace to regain SP because the calling card has been sent. And even if the player could leave the Palace in this event, this would permanently lock them out of being able to steal the treasure because the opportunity created by the calling card has expired, leading directly to one of the many Non Standard Game Overs in the game. Mercifully, the game does give you an escape clause; if you kick the bucket during the final treasure run, you are given the option to rewind the game one week. In Tales of Maj'Eyal, killing Aeryn before she tells you about the slime tunnels makes it impossible to reach the final dungeon. Attacking friendly NPCs in this game is never necessary (and while it might be in character for a Ziguranth PC, the campaign doesn't assume a raving fanatic). Fallen London has an unusual example where an Unwinnable by Insanity ending is deliberately put into the game: the Seeking Mr Eaten's Name storyline is designed to repeatedly punish the player character in every possible way, culminating in a final choice which will render their character permanently unplayable, without any positive consequences at all, and requiring the player to spend real world money for the dubious privilege. What makes this Insanity is that the game repeatedly tells the player that following this storyline will only make things worse at every stage, and spells out exactly what will happen if you pick the final choice (even warning the player that there won't even be any interesting flavor text), and after a later update, even just entering the storyline automatically grants you an item which will immediately take you out of it at any time. As it happens, the entire thing was written as an experiment to see how far players will be willing to destroy their game just to see what comes next. As Seeking Mr Eaten's Name has become a very popular - and certainly the most well known - storyline, the answer is clear. If you close the door to Pollux's house in Billsville, it will automatically lock. Since no NPCs ever open the door and there's no key to it, closing it while inside the house will leave you trapped forever. In the second Vex Chamber, it's possible to push one of the blocks over or into the escape path. Since you can't pull them, you can't get it out of the path to solve the puzzle, nor can you use the escape path, for obvious reasons. In the short story "Touching Centauri" in Stephen Baxter's "Phase Space" anthology of sci-fi stories, scientists discover that the universe they can observe is actually a highly sophisticated simulation, which is expanding its scope at roughly the same rate that humanity advances. So they do something the simulation designers never expected: concentrate nearly all of the resources of the human race into sending a high-powered laser to Alpha Centauri, which arrives beyond the horizon of the simulation faster than humanity would reasonably be expected to get there. As a result, the simulation starts collapsing, all of space overlapping with alternate timelines and possibilities as the effect draws closer to Earth, when it is then effectively game over. Takara Tomy thought of nearly everything when they made a licensed Collectible Card Game based on Inazuma Eleven. Every card has a "BCP" number in the corner, which is used for several things including tiebreakers: in case of a tie for action precedence, each player flips over the next card in their deck and higher BCP wins out. If both have the same BCP, repeat until the tie is resolved. All cards drawn are discarded after the tie is resolved. If one player runs out of cards, they shuffle their discard pile and start drawing cards from there. If their discard pile and their deck are both empty, they automatically lose. Now, if both players made their decks solely out of cards all with the exact same BCP value and they hit a tie while having the same total number of cards in their deck + discard pile, the game would go into a recursive loop until both players run out of cards, ending the match in a double loss. In Chess, underpromotion allows for this. If a player underpromotes to a knight or a bishop in a king and pawn vs. king endgame, at which point promoting to a queen would have been practically an Instant-Win Condition (unless you mess up the sequence and accidentally stalemate instead), the game is immediately unwinnable, ending in a draw, because there are no possible moves to checkmate the king. Since the game ends immediately, this overlaps with Press X to Die. For that matter, if one really wants to, there is technically nothing stopping a player from deliberately sacrificing all of their pieces for no advantage, though the opponent may well Rage Quit over one's obvious contemptuosity. Players determine the form of the final boss using "kernelsprites". Whatever you put into it forms part of the boss's final form that you have to face. One player (thanks to a couple of less-than-benevolent players from another session) stick an omnipotent being into the kernelsprite, thus making the final boss nigh-on-unkillable. Another group of players didn't put anything into the kernelsprites. While this stopped the enemies and final boss from gaining any special powers, this prevents the Reckoning, and thus the final boss fight, from occurring. This makes the session doomed to continue in stalemate for eternity. Two siblings had planned on playing the game with only two people rather than the larger groups it was made to be played by (to be fair, they didn't really have anyone else to play it with). This would have (barely) worked, until one of the two killed the other before the game began and then tried to play alone. This resulted in a game so severely different that it could barely be called the same game (but it appears that the game was designed to address this possibility). In Garfield's Scary Scavenger Hunt, if you've already picked up every available donut box and inventory item, but neglected to pick up the cheese in the TV room AND your scare meter is over 90%, it's game over. Trying to get the cheese will spring a trap that puts your scare meter over 100%, and Garfield will run out of the house in terror. But you have to be playing really stupidly to trigger this - the cheese is one of the first items you see, and you're unlikely to get your scare meter that high unless you're a complete beginner or just messing around.